Stork is a minimal and super clean one column WordPress theme for blogging. 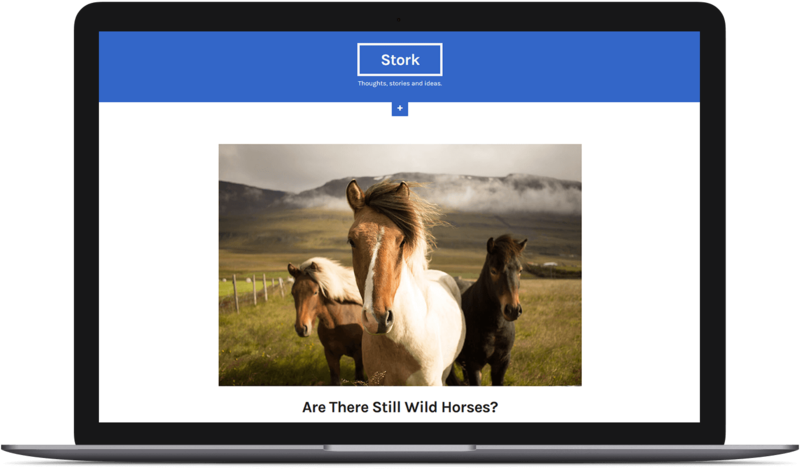 Stork is a little different than most WordPress themes you find today. You won’t find complicated customization panels and the theme set up process won’t take forever to complete. Stork is a minimal and straightforward blogging theme built for readability. Recommended plugins: Jetpack, Contact Form 7. Stork offers just the right amount of options that will help you to adjust the theme to your style. You will regularly get theme updates with new theme features and bug fixes. Also, we make sure that the Stork theme is compatible with the newest WordPress version. You can translate the Stork theme to you preferred languages with ease. We provide Pot files for easy translations. Stork is 100% responsive, meaning your site will look great and adapt smoothly to any screen size from desktops down to mobile phones. In fact, we have tested the Stork theme on several various devices (iPhone, Windows Phone, Android, iPad and etc.) to make sure we deliver the best browsing quality on mobile. If you need help setting up your WordPress site, we provide swift, one-on-one email support. We know our themes inside out, ask us anything. Our themes are built with WordPress standards in mind and this approach makes our themes compatible with popular WordPress plugins, like Jetpack, Contact Form 7, Yoast SEO and other.